While easyJet is not the first carrier to take delivery of an A320NEO, last week’s ceremony marked the 300th A320 Family member to join the airline’s fleet, a milestone commemorated by a special livery and by a particularly lavish celebration at the Airbus complex in Toulouse. 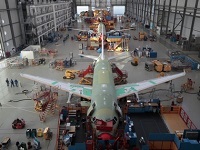 The occasion also allowed Airbus to show off the A320 final assembly line, or FAL, at Toulouse, now in constant motion with three others around the world as the manufacturer deals with the 5,000-plus firm orders for the aircraft. 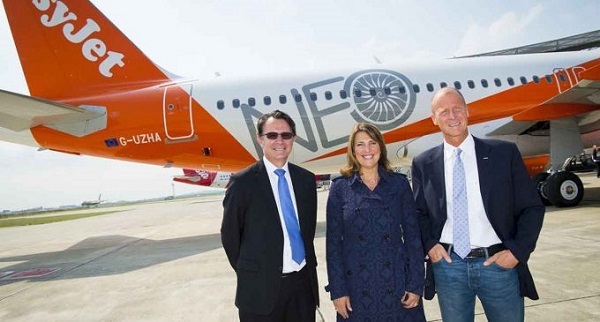 A feature of the easyJet handover ceremony, attended by airline CEO Carolyn McCall, Airbus CEO Tom Enders, Airbus Commercial Aircraft president Fabrice Bregier and CFM International CEO Gaël Méheust, was the emphasis placed by McCall on the importance to the company of the LEAP-1A. This is one of two engine choices for the NEO family. The other is the PurePower PW1100G-JM from Pratt & Whitney, which powers the Lufthansa A320NEOs and like the CFM model is designed to be especially environmentally friendly. This last fact enabled McCall to announce that with the addition of the A320NEO and A321NEO to the future easyJet fleet and with further planned efficiency improvements, the airline had now set itself a new, tougher carbon emissions target of 72 grams by 2022 – a 10% reduction from today's performance and a 38% improvement from 2000. According to Airbus figures, the NEO compared to previous aircraft saves up to 15% in fuel burn and CO2 emissions and reduces noise pollution by half on take-off and landing. The easyJet model will be based at Luton Airport and began operating commercial flights on Friday to Amsterdam, Madrid and Edinburgh. McCall said easyJet was also looking forward to receiving the A321NEO in the future with its longer range and 235-seat configuration. 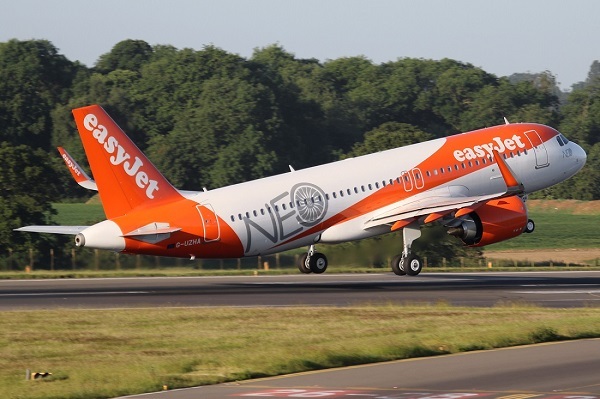 This follows the airline’s announcement last month that it was converting 30 of its A320neo orders to the A321neo version as part of the existing easyJet Airbus framework agreement signed in 2013. First delivery is expected in July next year. The airline says the A321neo will enable it to continue to grow in slot constrained airports with an increase in seats per flight of around 30% compared to an A320 and 50% when replacing an A319 while benefitting from the lowest operating costs in the single-aisle aircraft category. How this translates to the shopfloor was demonstrated at the A320 final assembly line, where the aircraft are being put together at a high rate. Toulouse is home to one such facility; it was then supplemented by a second at Hamburg to cope with demand for the A320 and later by a third installation in Tianjin – the first Airbus assembly line to be located outside Europe. The company has now also expanded this production network to the US, with a facility in Alabama. Fuselages for the A320 arrive from the manufacturing plants, usually aboard the distinctive Airbus A300-600ST Beluga Super Transporter, in two segments, which are joined at Station 41 to begin the aircraft build-up sequence. The completed fuselage is lifted into duplicated positions, designated Station 40 and 35, where the two wings are mated, along with the integration of engine pylons and landing gear. The aircraft then move to a multi-purpose bay for system tests, and are then readied for cabin installation. This clears the way for the final operations: engine installation, fuel and pressurisation tests, painting, engine run-up and flight testing, followed by aircraft acceptance and delivery.